I've almost got 1968/1969 (my Senior year) completed. My brother sent me his old Catamounts as well, which go through 70/71, although not complete. Unfortunately somewhere in updating my hardware and software, for a while, I lost the ability to create searchable PDFS with the original fonts from the Catamount. The newer OCR software installed with a newer scanner would try to match the fonts to ones on my computer and the Catamount scans were coming out with jumbled fonts intertwined looking something like ransom notes(!) and nothing like the original, except for general spacing, graphics, etc. The headlines were either interpreted as graphics or substituted into some crazy font. Anyway, I took several days, (had to un-install IE 7 for obscure reasons involving certain older HP-provided software which (after reading others experiences on various forums) I found would only install properly with IE6! ) and finally got the old software back to where it's working. As soon as I get done checking the content, I'll release the school year 68/69. I've been experimenting with doing a Catamount-page-per-pdf on some of the 1968/1969 stuff instead of a Catamount-edition-at-a-time. I think for usability (once the file is loaded) the edition-at-a-time is nicer, but it's very difficult to scan that way, and also very slow to download the whole edition of you only want to see a single page. I've heard through my blog from Gary Berdon this week, and we've had a chance to reminisce a bit about things and people we remember. It also seems like I'm getting a couple of hits per week on my profile at classmates. I also had a "google trap" go off this week to find out that someone has made yet *another* movie about the Third Wave - this time in German. A new film called "Die Welle" premiered at Sundance film festival this month, and apparently Ron Jones himself went to the premier. There's video (not very good) of Ron speaking at Sundance on aol video. The film's trailer/teaser (in German - and worth watching) are at www.welle.info . Anyway, the 1968/69 Catamounts have a lot of space regarding Ron Jones and his failure to achieve tenure, his call for a hearing, and his subsequent resignation. There's also an interview with Ron Jones in a later Catamount (after I graduated, but it's in my brother's material - Vol 14, NO. 10, front page by Dave Suliteanu) where one of the reporters went to Jones' new workplace (in March 1970) where he further discusses his retrospective. In that interview, he gives the (fortunately incorrect, yet ominouos) expectation that conditions in society would be such that "My wife and I don't expect to be alive five or ten years from now." - and "Violence is one means of communication, a very justifiable means, but I can't operate in that way yet; maybe tomorrow I will." Actually, since there's likely to be interest in this with this film coming out, so I think I'll go ahead and scan that one edition for now and will try to pick up the rest of the 69/70 stuff as I get time to do them. So for the near future, there will be one edition of 69/70. I've scanned everything I have (plus one of my brothers) for 68/69, which was my senior year. Hopefully the classes of 67 and 68 have enjoyed reviewing these old papers prior to their 40th reunions. Mine will be next year, so hopefully my class will enjoy these as well. I was disappointed to not have Volume 12 number 1, the first Catamount I have from 67/68 is number two - dated October 6, 1967. It's been a long time since I've touched the site - mostly because I've started consulting again, so trying to do a Catamount in an afternoon is no longer possible most of the time. 8th grade English at Wilbur was (for me) an interesting class - Mrs. Wolfrom wanted to teach us using "linguistics" rather than traditional grammer, which I really enjoyed. The teacher the next year (Mrs. Forbush) was of the old school "grammer", but after those two classes, I found I could pretty much analyze and parse anything thrown at me. The exposure to linguistics made it easier later to learn more about computer languages as well. These two teachers were opposites in many ways, but I learned a lot from both of them. Mrs. Wolfrom's class *did* have a - shall we say - "hiccup", which I think was what precipitated events leading to Wendy's comments in "The Amateur" and that was because we had a reading specialist come in periodically that many of the students didn't care for. He was armed with things like SRA reading labs and tachistoscopes (darn - no Wikipedia article on that - it's a device that flashes things like words up for very short periods of time - it was supposed to help us read faster). Anyway, there was a revolt of sorts by the students in our class, and as I recall Wendy was one of the ringleaders... and he went away and didn't ever come back, which probably put Mrs. Wolfrom in an awkward position. I thought the tachistiscope was kind of fun actually. I also exchanged emails with former Catamount columnist Doug Monica who graduated a year ahead of me. (Doug's mom and my mom were good friends - I think they both worked on the Pete McCloskey campaigns - back in the 70s. I got to drive him (Congressman McCloskey) to the airport once on a messy rainy night back in my college days. His son and I were at UCSB at the same time). 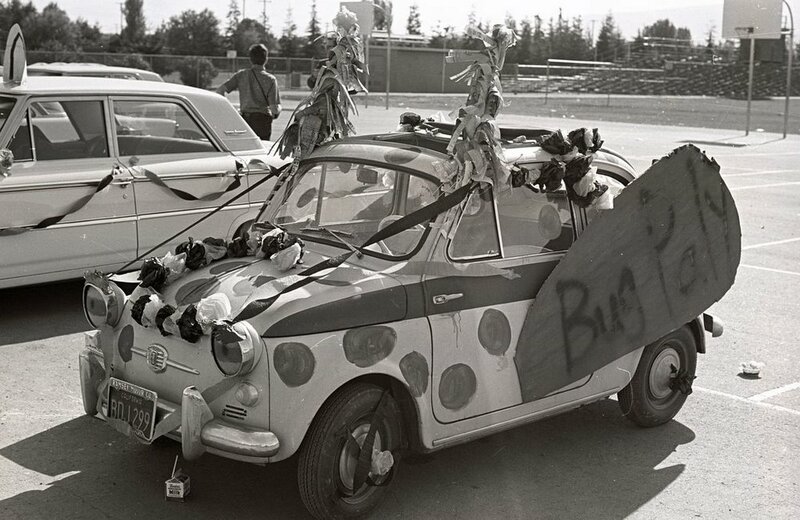 I slso got email from a teacher in Palo Alto who is doing a wonderful site on Palo Alto history. Check it out at http://www.paloaltohistory.com/. Much of what is covered in this issue of the Catamount that I just put up is covered in former Cubberley English/Journalism teacher Sylvia Williams' book Hassling (hardcover) , or Hassling (paperback) which she wrote in the early 70s. It is out of print, but if you follow the links you might find a used copy. I was in Palo Alto last weekend, and stopped by Cubberley to have a look at the place... it's amazing how much of it looks the same. 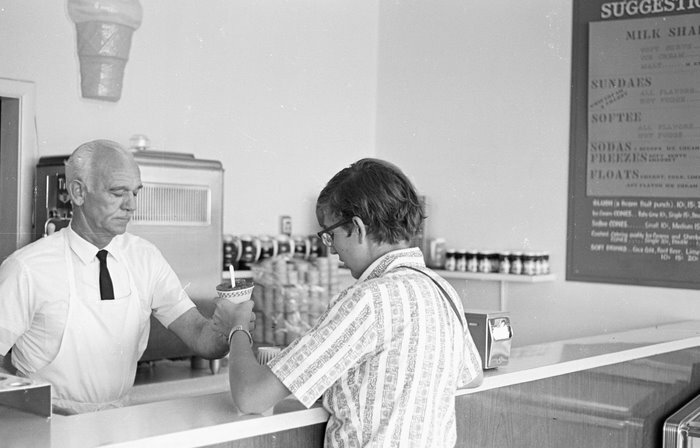 Especially since I've been trying to catalog the ads in the old Catamounts, I also went over to Charleston Center to look around (and pick up an Ice Cream) at the still-well-attended ice cream store (photo from 1967 or so). I also popped my head in the barber shop to see if Tony was still in there - he is! I remember Tony from one of the Midtown barber shope (I think it was the one by Round Table), and then he moved down and took over the business at Charleston Center. My dad used to ask for him specifically, and Tony always took good care of his hair. I promised Tony I would upload this photo he helped me set up back in probably 1968 or 1969. 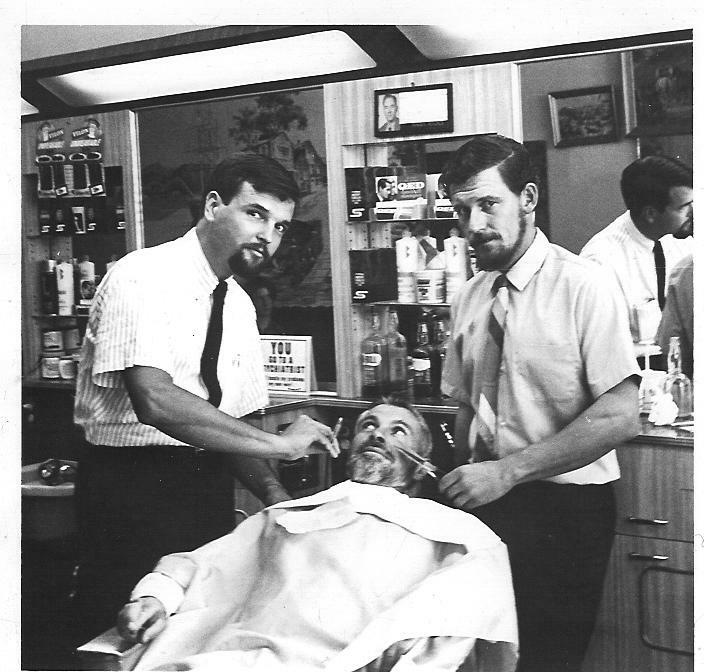 The three teachers had all grown beards over the summer, and I think the story was that Mr. Dale (left) and Mr. Warford (right) were going to keep their beards, and the apprehensive-looking Mr. Putnum (in chair) was going to shave his off. We didn't "have it off" right there in the barbershop, but this was sure fun to set up. Both the ice cream store and the barber shop were faithful advertisers in the Catamount when I was in high school. The ice cream store looks quite a bit the same - they manufacture their own ice cream, and it's great! I don't know if they make it there onsite, or if they do it elsewhere, but we sure enjoyed ours.